Have you ever read a book that described fictional foods you desperately wished you could try? I blogged about this topic in detail a few months ago. 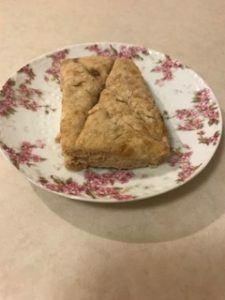 Recently, I decided to finally try the closest thing to real Lembas bread that exists on our planet since the elves left Middle-earth at the end of The Lord of the Rings. Not only is this recipe simple, it uses ingredients that are very common. You might have all of them in your kitchen already! Not having to shop for obscure ingredients that I probably won’t use in any other dishes was one of the main reasons why I chose this particular recipe to try. I bake pretty infrequently (as you’ll hear about below), so I generally only buy seasonings, spices, and other things that I can use in multiple ways in the kitchen. I’m copying over the ingredients and instructions into this post so that they’ll still exist somewhere if the site I linked to above ever goes down. Do click on over for the nutrition information and for a gorgeous picture of the final product, though. If you want to know my detailed thoughts on making this recipe and how I’d change it in the future, keep reading. 1) Preheat oven to 220 degrees Celcius (425 degrees Fahrenheit). 2) Mix the flour, baking powder and salt into a large bowl. 3) Add the butter and mix with a fork or a pastry cutter until the mixture resembles fine granules. 4) Add the sugar and cinnamon, and mix them thoroughly into the mixture. 5) Add the milk/cream and vanilla and stir them in with a fork until a nice, thick dough forms. 6) Roll the dough out about 1/2 in thickness. 7) Cut out 3-inch squares and transfer the dough to a cookie sheet. 8) Criss-cross (DO NOT cut all the way) each square from corner-to-corner with a knife. The first time I try any recipe, the only substitutions I make are to replace any milk and milk products in it with foods that won’t cause any allergic reactions for me. It’s important to know what something is supposed to taste like before you fiddle around with the ingredients too much. I used vegan butter instead of traditional butter and almond milk as a replacement for the milk/heavy cream. If you consume dairy products, I’d love to know how this turns out with them. The dough did feel slightly dry when I was rolling it out. That made it a little challenging to keep the dough together when I was cutting it into pieces. When I make this recipe again, I’d like to see how it turns out with a full cup of almond milk. I suspect that will be just enough additional liquid to solve the minor issues I had with getting the dough ready to be baked. As I mentioned above, I don’t regularly bake stuff like bread or sweets. My supply of brown sugar had dried out, and I didn’t know that was the case until I’d reached that section of the directions. It was slightly challenging to mix that ingredient into the dough thoroughly. The little brown speck you see in the final product was a result of that. Next time I’ll use fresh brown sugar and won’t have that problem. Raisins might be a nice addition to it as well. Despite my minor problems with the dough, the final product tasted delicious. It is definitely something I’ll be making again. I know that my tastebuds have changed since I started eating a low sugar diet, but the combination of cinnamon, maple syrup, vanilla, and brown sugar made me think of it as a dessert. Keep in mind that this isn’t as sweet as a typical dessert, but it does have a sweetness and chewiness to it that made it an appealing snack. The Lembas bread I made two days ago has been keeping well so far. It honestly tastes even better after it’s had a day or two to rest. I love non-fussy recipes like that.